“These beings are from the Sombrero Galaxy or M104 which is 28 million light years from earth. Yes, in a galaxy far far away. Mantis exist from 3D up to 9D. These are insectoid beings that have features similar to the Praying Mantis insects of Earth, but they stand upright and are at least 8-9 feet tall. 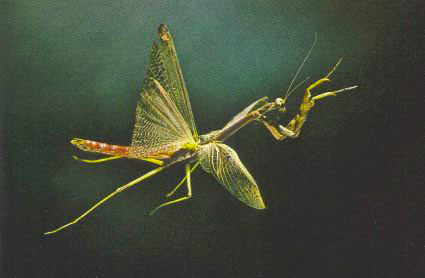 Higher dimensional forms are energy beings that maintain their Mantis shape with colorful light. These beings evolved hundreds of millions of years ago on a planet of insects. They became the first to develop advanced self awareness. They developed the use of tools but in unison they became highly sensitive to sound and light and its reflection in colors. They used this special heightened awareness and became highly advanced in the connection and use of frequencies to change their environment and to communicate with each other and their surroundings. In their historical past, Mantis were matriarchal. They have strong female figures who dominated their cultures. Higher dimensional beings have created a more balanced arrangement with these energies. However, the feminine force is still regarded highly and one would not want to diminish this power with a Mantis around. Sensitive to sound, color, and vibrational nuances, luminous, spiritual, healers, graceful, fluid, artistic, penetrating, influential. The Mantis beings are masters with vibrations of sound and color. They use this mastery to heal and create. They are artists of universal light. They dance through frequencies and alter their surroundings as they do so. Mantis beings create bubble like force fields to travel through time and space. In lower dimensions they create living spherical ships of light. In higher dimensions they can send their light bodies in single bubbles of light across the universe. Mantis beings are called upon to give guidance and direction to assure high quality standards to all kinds of projects. They assure that the frequencies are appropriate and that the atmosphere and players are conducive to the particular outcome that is desired. They are like the mural painters and anthem singers of in the universe. They bring the right elements together. Their focus is weaving color and sound to create and enliven the light web of the universe. The Mantis are assisting, and in many ways overseeing, the Zeta Reticulan hybrid program, and human spiritual advancement project. Like the Zetas, they were asked by Galactic Councils to participate. They are assuring that universal principals are adhered to as well as giving their expertise in frequency alignment. They are the artists in the hybrid process. They are often seen in the background during abduction experiences. These are usually 4-5D Mantis beings, but they are tuned into guidance from their higher dimensional kin, who play a part in spiritually guiding them. Prior to this recent involvement, Mantis have had little to do with Earth, other than gifting the planet with the Praying Mantis insect that has since evolved into many glorious colors. These little creatures hold special energy of their Mantis parents. It is no wonder that they are revered by many and are often seen as positive omens. ‘The Archons established the practice of ‘kingmakers’ on Earth’s surface about 12,000 years ago. The history was written and the people were selected to play the main roles towards leading us to the present day.